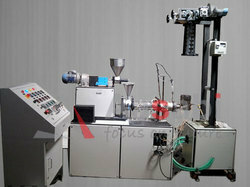 We are leading supplier of Lab Extruder Maschine. It is a Twin screw co-rotating Food extruder. It produces expanded snacks from corn, soy, rice and other cereals like Cheese balls, soy nugget & TVP protein. Can produce animal and pet food for dogs, horse, fish and other animals. Also suitable for producing instant baby food and cereals which can cook fast and ready-to-eat. Soy-dal analogue from soy wheat, many others. 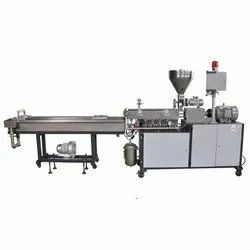 SHEET EXTRUDER MACHINE SET of upto 120 mm dia screw with L/D ratio of 33:1 and other sizes. The extruder also has a complete set of accessories including feeding hopper, moulds for sheet extrusion with 3 roller calendars, cooling devices and conveyor systems. The machine is ideal for manufacturing of sheets and several other applications. Output : 70Kgs/Hr.- 700 Kgs/Hr. Twin screw extruders are designed with latest technology to achieve higher outputs at lower electrical power consumption. This extruders can be used for producing pvc pipes for drinking water, irrigation, plumbing, casing, conduits etc. .
- PVC Compounding, alloying and mixing of polymers. Masterbatches. - Manufacture of powder coating compounds. - UPVC conduits, pipe and profiles. - PE, PS foam sheet and blocks. . These systems are commonly deployed for processing PET, PLA, TPU, EVA, PVB and PVC. Parallel twin screws offer higher production rates within a single extrusion system. This system offers the best melt and pressure environment for PVC and WPC. Twin Pipe Extrusion is an important alternative when high outputs are to be achieved even with smaller pipe sizes. The line comprises of a single high output Extruder with Twin Die, Vacuum calibrator, Haul-off and Cutting saw offering an impressive price/ performance ratio. the kolsite- battenfeld expertise offered india first twin- screw extruder with high output for manufacturing of pvc pellets. These extruders give high operational reliability, high pressure build up capability with smaller temperature increase and large degree of freedom in the formulation.